Why do state legislators continue to want to dictate what women do with their bodies when it comes to reproduction issues? Why do they continue to crusade against science? On Thursday, the Oklahoma House passed a bill, sponsored by state Rep. Rebecca Hamilton, an Oklahoma City Democrat, which would make it illegal for state fertility clinics to compensate women for donating eggs. Under the bill, women could still donate eggs. They just couldn’t be paid. The bill’s intent, according to Hamilton, is to cut down on a practice she sees as harmful, but what’s to stop Oklahoma women from simply traveling out of state to donate eggs? Is she not worried about those women who donate eggs without getting compensated and are only doing it to help people build a family? Is she not worried about those women who use their own eggs during in vitro fertilization procedures? As a college professor, I have discussed and debated this issue with students because companies seeking egg donations often target young college women through advertisements. There are competing arguments about compensation for eggs and the procedure itself, and these are worthy of a medical ethics discussion, but the bottom line is the legislature simply has no business meddling in this issue, which is a personal and private matter between egg-donor women, physicians and people trying to get pregnant. A NewsOK story cited two doctors who say the bill, if passed and signed into law, would severely limit the options of local people trying to get pregnant using the eggs from another woman. For me, the issue raises some areas of consideration. (1) The state of Oklahoma doesn’t own women’s bodies. Too much of our political discourse in this state surrounds women’s reproductive issues, including abortion. These are private matters. The government shouldn’t interfere with medical decisions made by women under the care of physicians. Medical guidelines should be allowed to govern how the egg donation procedure is performed and how many times. This is simply more government intrusion into people’s lives, and it’s basic discrimination against women. (2) The attack on science here must stop if the state wants to move forward. In the recent past, local politicians have attacked evolution theory in schools, local stem cell research and climate change. Now, it’s egg donation. These anti-science efforts make the state seem backwards and have a real potential to hurt the quality of life here. What if there were no or fewer fertility clinics in this state? (3) What about women who want to donate eggs out of compassion for people struggling to get pregnant? As I mentioned, Hamilton’s bill doesn’t provide “relief” for these women. Under the bill’s logic, it’s apparently okay if an Oklahoma woman is harmed during the egg harvesting procedure, just as long as there is no compensation. If the bill’s intent is to protect women, then why doesn’t it try to protect all women here, not just women seeking money for eggs? If the procedure is highly damaging to women, as Hamilton argues, then why not just eliminate in vitro fertilization altogether. (4) The process of donating eggs can be fairly rigorous, which helps prevent exploitation. Women who are compensated for selling eggs must be in good health with a decent medical history. These women are screened in several different ways. Look at the requirements for women at the Texas Fertility Center. To make a point, state Rep. Ryan Kiesel, a Seminole Democrat, offered an amendment to the bill that would stop men from selling sperm, but it was defeated and the bill easily passed. The Senate should defeat Hamilton’s bill. If it passes, Gov. Brad Henry should veto it. Did you know that doctors in Oklahoma will not artifically inseminate a single female? That it is not considered legal in Oklahoma to artificially inseminate a single female. This is based on the reference to “husband & wife” in the artifical insemination statutes, 10 O.S. sections 551 et seq. 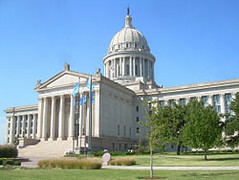 and an Attorney General opinion, 1983 OK AG 162, which interprets the statutes to exclude single women.